Darling Performance Horses and the family of Cody and Michelle Darling are excited to stand Guy On A Mission to the public for the first time! This 2012 bay stallion is an own son of Frenchmans Guy (Sun Frost) and Serious Spender (Bills Ryon). The decades #1 Leading Living Sire with progeny earnings over $10 million! As an athletic four year old, Mission IS ON a mission and showing serious talent in his training with Steve Orth. In addition to winning several jackpots, Guy On A Mission qualified in Jr. Heading for the 2016 AQHA World Show! Mr. Orth has said that Mission is one of the nicest studs he has trained- he is easy going, quiet, and very trainable. Guy On A Mission stood privately last breeding season, and his first colts will hit the ground in 2017. Don't miss out on the LIMITED BOOKINGS for the 2017 breeding season! DARLING PERFORMANCE HORSES ARE ALSO PROUD OWNERS OF MORNING TRAFFIC, aka Martini, who is run by Stevi Hillman. 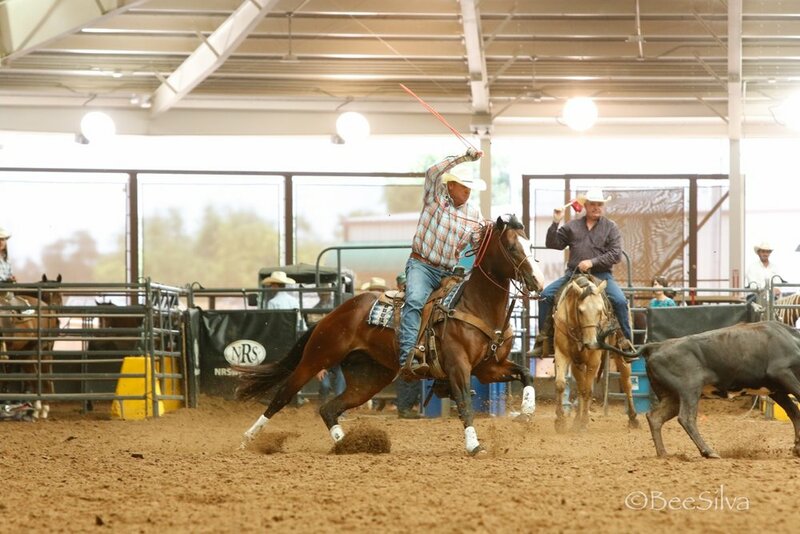 The team were winners of the famous Pendleton Round-Up and NFR Qualifiers! Morning Traffic and Ms. Hillman had the fastest run of the 2016 All American Finals with a time just one one-hundredth off the arena record. Help Michelle and Cody Darling cheer on Stevi and Martini at the 2016 NFR! Collection and shipping will be professionally handled by Oklahoma City Equine Clinic Reproduction Services, a SBS Affiliate.